Tracy lives in a spacious condo with her boyfriend and two dogs. After living there for 10 years, she is ready to update her living room. She is hoping that Lisa can get rid of the wall mural and create a more comfortable living space with an African theme. Lisa Quinn meets homeowner Tracy. Lisa checks out the living room, which has a huge dated mural on the wall. The crew gets rid of the dated mural and Lisa Quinn comes up with a plan for covering the mirrored walls. Lisa Quinn and her team turn a drab and dated living room into a comfortable and cheerful space. They also incorporated the homeowner's beautiful African art collection into the room. 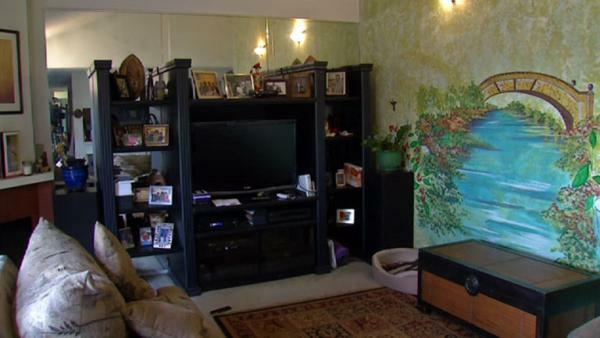 Lisa makes over a woman's living room, creating a more comfortable space that has an African theme.